Now that the sun is providing us with clear, warm days, Stellenbosch has come alive with bird life, new foliage and the smell of flowers and fynbos. A holiday in Stellenbosch during the summer means that the town comes alive with people exploring this idyllic pocket of heaven. 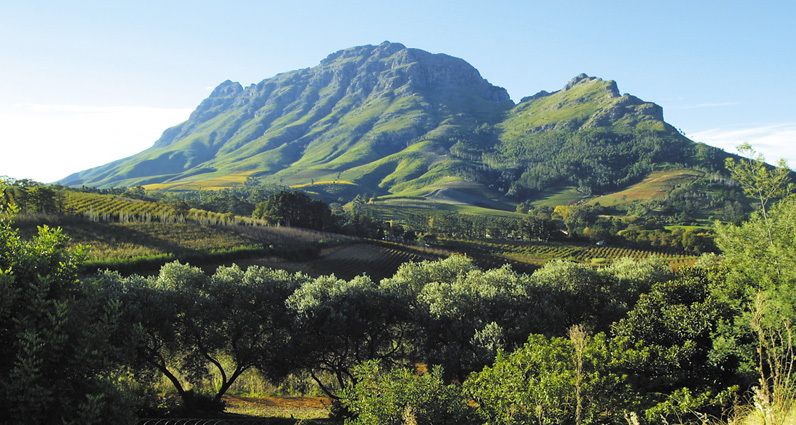 Make sure that you get to see Stellenbosch in all her glory by hiking or biking along one of these trails. A stunning nature reserve found just outside of town, Jonkershoek makes you feel as if you are light years away from stressful civilisation. The reserve is kept in immaculate condition and there is very good park security. Before you enter the park proper, an entry fee of R40 per person is required. The Swartboskloof-Sosyskloof trail is a route that can let you hike for either 4.3 or 6.7 km. Start by taking the gravel road at the gate and keep right at the fork for 3km until you reach the first parking area. This is the starting point for the Sosyskloof (route 1 on Jonkershoek Nature Reserve map) hike. This trail can take you on a comprehensive tour of the wild proteas that grow in the reserve as well as patches of dense indigenous forest. The Panorama Trail is breath-taking, in more ways than one. While quite taxing for those who have had to dust off those running shoes, the undulating landscapes that you are greeted with include the entire Jonkershoek valley, Assegaaiboschkloof towards Franschhoek and ends off with the Helderberg bowl and False Bay laid out in front of you. This is a day hike of 17km, so plan accordingly. For those who want to mountain bike, the single track that runs through the reserve is popular for cyclists of all proficiencies. It also leads to Lanzerac Estate, meaning you can enjoy post-trail wine tasting. Find a map of Jonkershoek here. Anyone who has driven through the slopes of Helshoogte will agree that the beauty is astounding at any time of day. Hiking to the summit of Simonsberg is a challenge but promises a view that characterises the magic of the Cape Winelands. The start is at the Thelema Estate at the top of the Helshoogte Pass that will take you past the vineyards. At the large dam, hikers need to take a footpath marked by a cairn that leads up to Simonsberg. The trail shows off waterfalls, views of Pniel, numerous vineyards and the smaller images of Cape Point and Table Mountain as well as Franschhoek Mountain, and the Hottentots Holland Mountain range at the summit. The hike will take between 6-8 hours. Found on the R44, just outside Stellenbosch, this centre allows you to feel the wind in your hair as you embark on a trail ride among the vineyards. A totally unique way to explore some of the best wine estates in the world, including Morgenhof and Delvera, ends with a wine-tasting to complete your vigorous day out. It is also advisable to let Bonne Esperance know if you are going on a hike, in case of an emergency. For more information on our accommodation, view our self-catering and guesthouse pages.